Victor Ciocâltea was many times Romanian champion. Ciocâltea was Romanian Champion in 1952, 1959, 1961, 1969, 1970, 1971, 1975, and 1979. He played for Romania in eleven Chess Olympiads from 1956 to 1982. He was a participant of four zonal FIDE tournaments (1954–1982) and many international tournaments. 1962, he tied for 1st–2nd in Sofia. 1966/67, he tied for 1st–2nd with Dragoljub Čirić in Reggio Emilia. 1968/69, he tied for 1st–4th in Reggio Emilia. 1973, he won in Tunis. 1974, he tied for 1st with László Szabó in Dortmund. 1975, he won in Bucharest. 1979, he won in Satu Mare. 1980, he won in Călimăneşti. 1981, he won in Val Thorens. 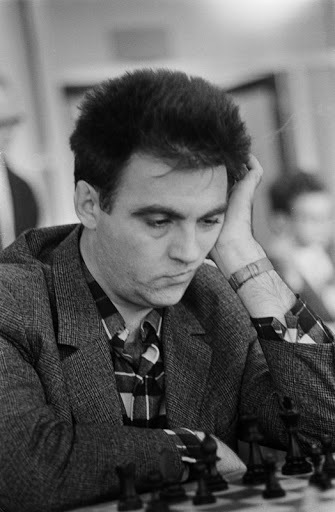 Ciocâltea died at the chess table, while playing a chess game at a Spanish tournament in September 1983. In the feature game, Hajbok,R got the better of GM Fodor,T jr with strong positional pressure. Hajbok used the original regrouping 23.Nb1!? ( with the idea of Nd2-f3 etc) and followed up nicely in a BB vs.BN ending. White’s bishops are a dominating force. How should white continue?